I mentioned Oh, Little Rabbit a couple of times last week & have been so giddy to share more about this handmade biz with y'all. I own this bicycle tee from them and I am not even slightly embarrassed to say that I wore it two days in a row...and slept in it. I am working on a wishlist of flour sack towels and more tees. 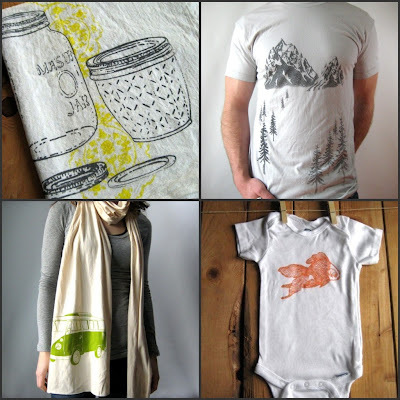 Oh, Little Rabbit is a husband & wife duo in Oregon that creates incredibly intricate and beautiful screen prints for onesies, tees for men & women, tea towels, scarves, and MORE! Let's get to know them a little bit better, shall we? My husband and I live in the northwest and love the outdoors, so a lot of inspiration comes to us while we are out enjoying Gods beautiful creation! And we are blessed to live in a place that is so rich with natural beauty! We also love antique malls and second hand stores. Vintage house wears and furniture are some of our favorite things! We love having things in our home with history and a story. We find a lot of inspiration for our imagery in treasures from the past and love for our prints to have that unique vintage feel and style. What is your favorite color//color scheme? I have always been a fan of blue/orange color combos, but I also love the more classic 50's ish mint green and bubble gum pink combination too! And my husband is a huge fan of anything with shades of green. What is the most gratifying part about owning & running your handmade business? I think the most gratifying part of running our handmade business is that it allows us to work together and create together! This business has been a dream come true for me and being able to share all the joys of it with my husband has been so rewarding. I love the ability to create art and imagery that I love and then turn it into something practical like a flour sack towel or baby onesie that pretty much anyone can have and use and enjoy over and over again! I love being able to share my love of art and creating with others! It is so nice to have a job I love and also be blessed with the ability to spend my days working with my husband! God has blessed us and we are so thankful! New to Yellow Songbird? 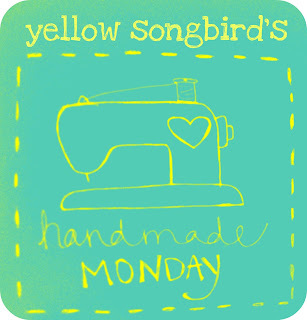 Feel free to check out more businesses that have been featured on Handmade Monday HERE. I like the goldfish shirt, as well as the matryoshka shirt! They look great, and I guess if they're comfortable too that's a bonus. lets just say that i spent way to much time adding their items to my wishlist last week....i really like their stuff! What a cute scarf! I love that onesie, too! Looove the shop!!! 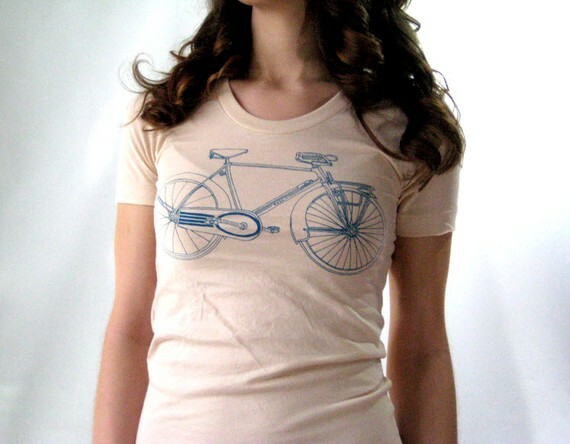 that bicycle tee makes me swoon! LOVE this! I love screen print tees! I love the bicycle! 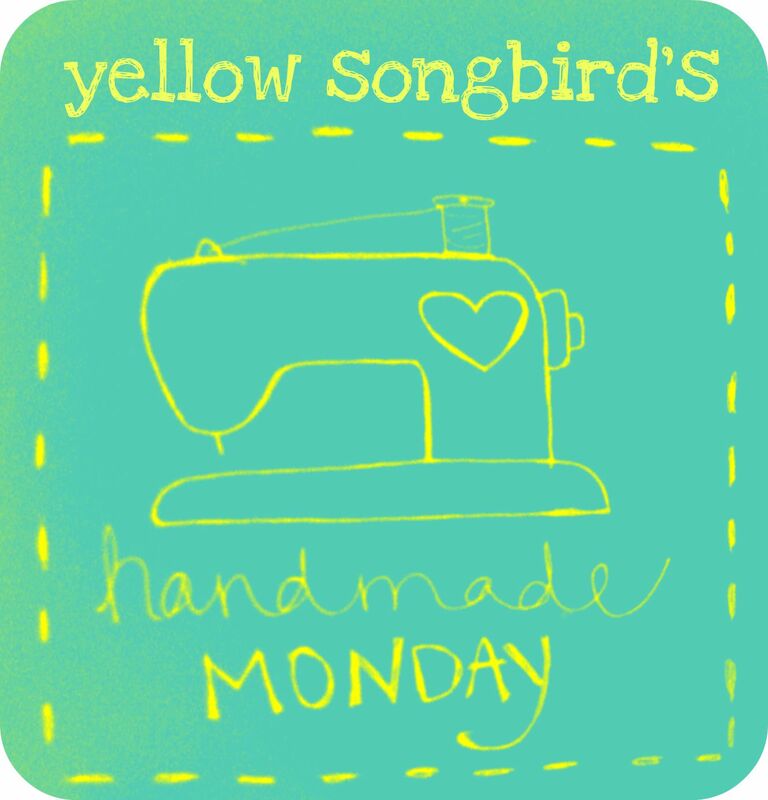 Thanks for continuing Handmade Mondays!!! What a great shop! I LOVE the t shirts and the onesies! Such a perfect business name, and that tee is adorable-no wonder you ended up living in it! I really like the baby and kid tees! Thanks for sharing. love their banner and products!